A decked-out game room can bring family and friends together like nothing else. These ideas are sure to get your game room makeover sparked up. Eight ball in the corner pocket! Nothing brings family and friends together quite like a decked-out game room. But why stop at the standard pool table and wall-mounted dartboard? We’ve got a few ideas for an ultra-modern game room make over that will blow your friends and neighbors away. Nothing screams "fun" like a theme. 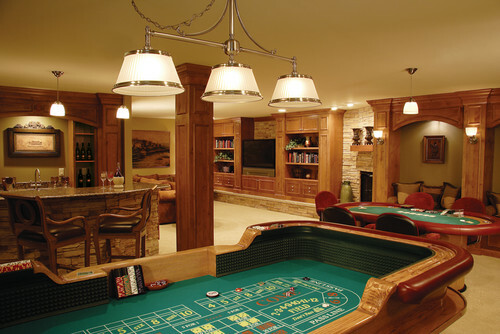 Dress up your game room like a casino, sports bar, pool hall or space-age game center. You don’t have to break the bank to achieve a completely themed look, either. Items like neon signs, retro wall décor and even old-fashioned popcorn machines can be found at your local craft or home goods stores. And don't forget that there might be many variations on a single theme. For instance, a casino-style game room might resemble a plush Monte Carlo casino or an Old West saloon. Fill the space with game tables, including poker, roulette and craps, and serve refreshments off an ornate hardwood bar. If sports are more your style, cover the walls with signature jerseys and game photos, and install a few rows of stadium-style chairs in front of the big screen TV. Instead of pool, offer foosball, a hockey tabletop game or a basketball hoop. If you’ve got your eye on a high-tech game room remodel, consider a wall-sized game simulator for racing, golfing or shooting. It's a sure way to wow guests and make them never want to leave. For the video game fanatic, mount flat-screen TVs on the wall to provide optimal viewing for players and spectators alike. If you’re planning on installing a game system that allows for multi-player, full-body game play, it's helpful to mount the monitor away from the action to provide players adequate room to participate. Before you begin your high-tech game room remodel, ensure that Wi-Fi and cable installation can be integrated into the walls or cabinets for a clean, visually appealing look. Plan to install all technical components in an accessible cabinet or panel for easy maintenance and upgrades. Families with younger children might want to consider maximizing space for activities when planning their game room upgrade. Bright colors, sturdy furniture and plenty of storage for toys and games are all important elements of the kid-friendly game room. A wall of shelves or rows of bins to hold games can help keep things organized after play time is over. Playful rugs printed with street designs, maps, puzzles and more add to the playfulness and interactivity of the room. You can even carve out an easy-to-clean zone specifically for messy activities, such as crafts and painting. A few unique touches can really make your family game room stand out from the crowd. A row of built-in aquariums, for example, can provide an eye-catching conversation starter, while custom-built beer taps will keep the fun flowing. Cheers!